This November Convekta Ltd released Houdini Aquarium 2017 - an excellent analysis tool combining the world’s strongest engine Houdini 5 and the updated ChessOK Aquarium interface. 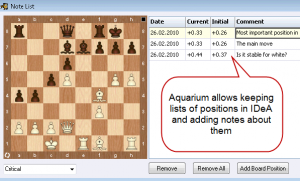 Houdini Aquarium 2017 is a revolutionary analysis, database and chess publishing tool, combined with the world’s strongest chess playing engine, Houdini 5. Houdini Aquarium 2017 offers advanced analysis functions, game commenting, searching, powerful chess trees, playing against the computer, databases, advanced publishing features and much more. 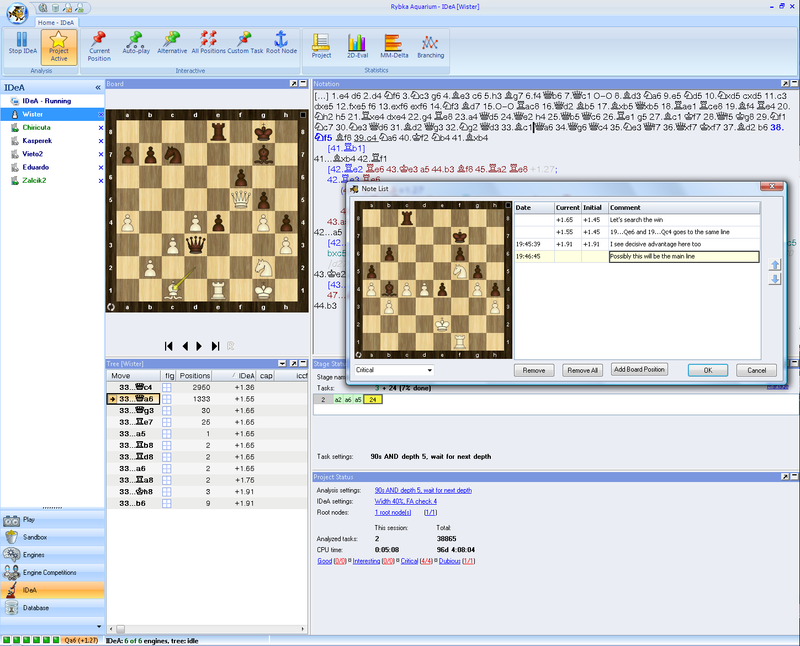 Houdini Aquarium 2017 includes the best chess engine – Houdini 5 UCI, 200 ELO points over its predecessor and capable of supporting 6 cores and 4 GB of hash, a powerful search system, a unique Tree mode, database of 6.6 million games in total (as of November 8, 2016), a Bonus disk Chess Opening Encyclopedia, 1-year access to 7-man Lomonosov Tablebases and 1-year membership at ChessOK Playing Zone. Houdini PRO Aquarium 2017 also includes Houdini 5 PRO UCI which can support up to 128 cores and 128 GB of hash. 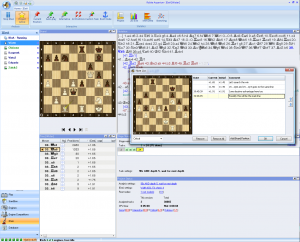 You can connect Houdini 5 UCI engine to Chess Assistant, Fritz and ChessBase. 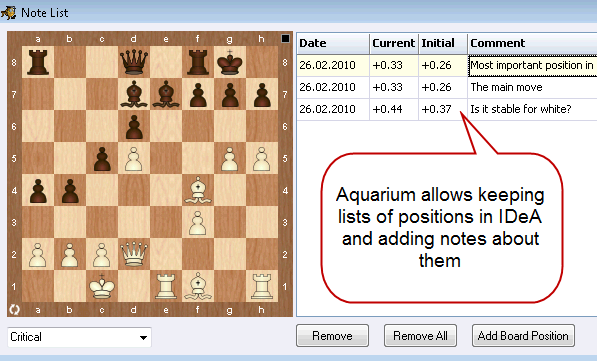 Interactive Deep Analysis (IDeA) is the most advanced chess analysis method available today and has been greatly enhanced in the latest instalments of Aquarium. The purpose of IDeA is to analyze a position deeply and return as much information about it as possible to enable the user to get a better understanding of the nuances of any position. Its approach makes it an essential weapon in the arsenal of every serious player and analyst! Aquarium Articles Reference Page - learn more about Aquarium’s functions and how to use them. The Interactive Deep Analysis, or simply IDeA, is Aquarium’s trademark feature and what really sets it apart from similar programs. It has come a long way since its introduction in the fisrt release of Aquarium, and is still improving. Serious players will probably find it is an essential tool to stay competitive. But explaining what IDeA is and how it works will require more than a few bullet points in the product description. If you want to know, go ahead and read on. Don’t forget that the “I” in IDeA stands for “Interactive” and your involvement in the analysis process is the key to understanding and improving the analysis. Analyzing with many engines. 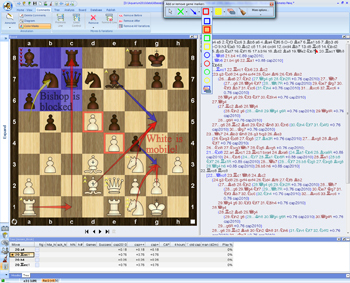 The current version of IDeA can split the analysis between many engines. You can, for instance, use four instances of single core Houdini for the analysis on a quad computer, essentially reducing the multiprocessor overhead to zero. It’s like getting one extra core for free compared to running Houdini in 4-CPU mode. Multiple analysis “roots” for a single project. The starting position for IDeA analysis is called a “root.” If you are analyzing a position in IDeA when another interesting position shows up in the tree, you can make it a new root, without even stopping the analysis. You can remove the original root or let IDeA analyze from both roots. You can use this feature to focus IDeA on selected positions without restarting it. IDeA can keep a list of all roots that have been used in a project. The “Tree width” parameter determines how wide the resulting IDeA tree will be. A “preferred side” can be set; e.g., for developing your opening repertoire. A list of “thematic moves” can be given. You can use them to ensure that certain moves are always analyzed. 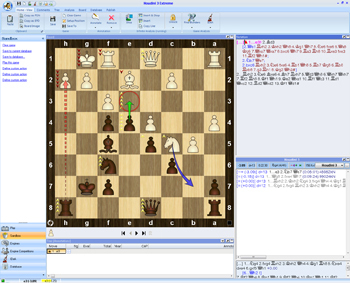 For instance, in an attacking game you might want to make sure that the moves Bxh7+ and Ng5 are considered. “False alarm check” immediately performs additional analysis of new moves that look “too good to be true,” preventing IDeA from spending more time on them if they turn out to be worse than they first looked. Browsing the analysis queue. You can see a list of all tasks for the current stage; which tasks were automatically scheduled by IDeA and which ones you added manually. The corresponding positions can be displayed on the board and you can see the engine’s output for the selected task, prioritize the tasks, and delete unnecessary ones. If there are tasks waiting in the queue when you stop the analysis, they will be stored and processed the next time you start the analysis, even if you restart Aquarium.